Last updated: 2002 March 05. 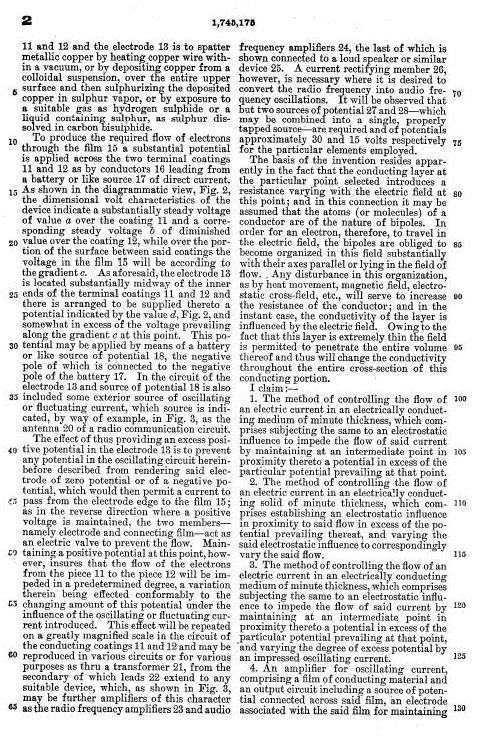 Dr. Julius Edgar Lilienfeld of New York, files for a patent on a "Method and Apparatus for Controlling Electric Currents". The application completely describes an NPN junction transistor and its use as an amplifier. 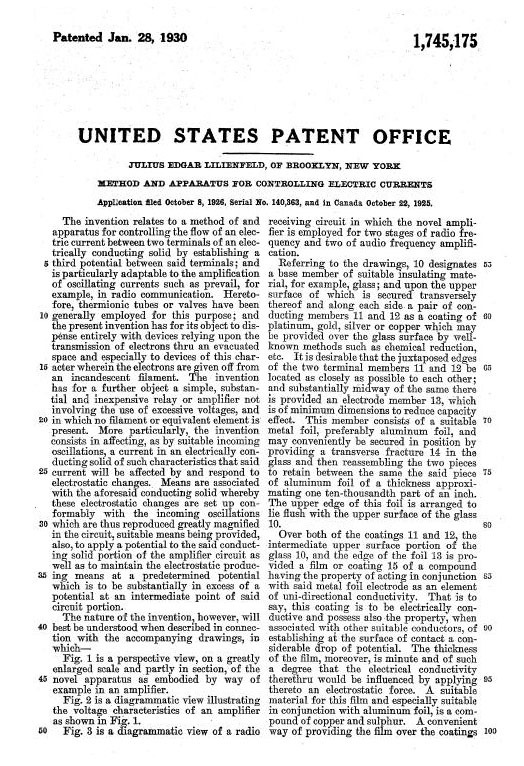 Dr. Lilienfeld is issued a patent for the first solid-state amplifying transistor. Patent No; 1,745,175 drawings Patent No; 1,745,175 page1 , Patent No; 1,745,175 page2 , Patent No; 1,745,175 page 3. Dr. Lilienfeld is issued a patent describing a multijunction NPPN or PNNP transistor. Dr. Lilienfeld is issued a patent showing an NPN transistor using copper-sulfide and aluminum oxide. William R. Hewlett and David Packard making electronic instrumentation, founded Hewlett-Packard. Three scientists at Bell Telephone Laboratories, William Shockley, Walter Brattain, and John Bardeen demonstrate their new invention of the point-contact transistor amplifier. American computer engineer Howard Aiken predicts that only six computers would be needed to satisfy the computing needs of the United States. 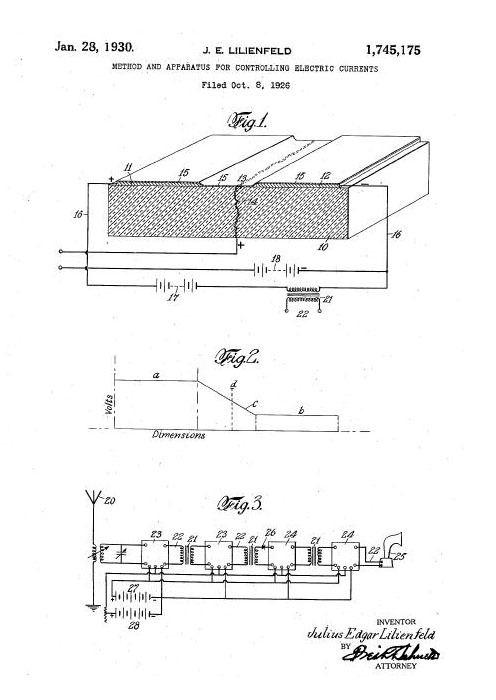 John Bardeen, Walter Brattain, and William Schockley of Bell Labs file for a patent on the first transistor. Coronado Corporation changes its name to Texas Instruments Incorporated. 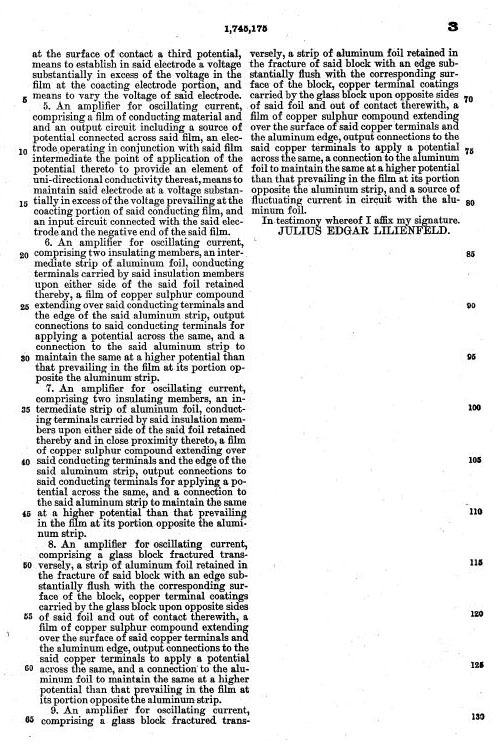 G. W. Dummer, a radar expert from Britain's Royal Radar Establishment presents a paper proposing that a solid block of materials be used to connect electronic components, with no connecting wires. IBM unveils the Defense Calculator, its first computer. Texas Instruments announces the start of commercial production on silicon transistors. Jack Tramiel founds Commodore as a typewriter repair service. William Shockley founds Shockley Semiconductor in Palo Alto, California. The Nobel Prize in physics is awarded to John Bardeen, Walter Brattain, and William Shockley for their work on the transistor. Digital Equipment Corporation is founded. 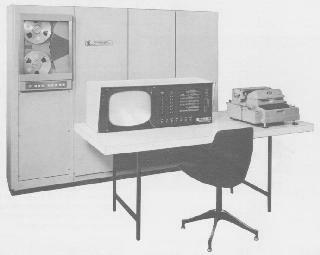 IBM introduces the IBM 608, the fist all-transistor commercial calculator. A group of eight engineers leave William Shockley's company to form Fairchild Semiconductors. 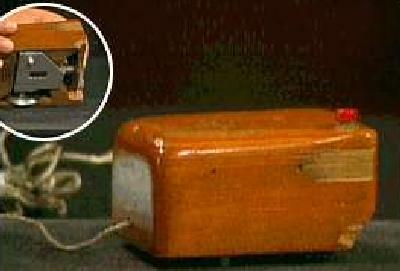 Texas Instruments demonstrates the first integrated circuit. Fairchild Semiconductor files a patent application for the planar process for manufacturing transistors. The process makes commercial production of transistors possible and leads to Fairchild's introduction, in two years, of the first integrated circuit. Texas Instruments and Fairchild Semiconductor both announce the integrated circuit. IBM develops the first automatic mass-production facility for transistors, in New York. Digital Equipment introduces the minicomputer, the PDP-1, for US$120,000. Spacewar! is completed on the PDP-1. Spacewar is shown to the public at the MIT Open House. Teletype ships its Model 33 keyboard and punched-tape terminal, used for input and output on many early microcomputers. Ivan Sutherland creates a graphics system called Sketchpad. Commodore Business Machines sells shares to the public for the first time. Charles Tandy buys the Radio Shack Corporation, for free. John Kemeny and Thomas Kurtz develop the BASIC programming language at Dartmouth College. Texas Instruments receives a patent on the integrated circuit. IBM coins the term "word processing". Steven Gray founds the Amateur Computer Society, and begins publishing the ACS Newsletter. Some consider this to be the birthdate of personal computing. The first Consumer Electronics Show is held in New York City. Douglas C. Engelbart, of the Stanford Research Institute, demonstrates his system of keyboard, keypad, mouse, and windows at the Joint Computer Conference in San Francisco's Civic Center. He demonstrates use of a word processor, a hypertext system, and remote collaborative work with colleagues. Hewlett-Packard introduces the first programmable scientific desktop calculator. Robert Noyce and Gordon Moore leave Fairchild Semiconductors. Robert Noyce and Gordone Moore found Intel Corporation. Ed Roberts and Forest Mims found Micro Instrumentation Telemetry Systems (MITS). 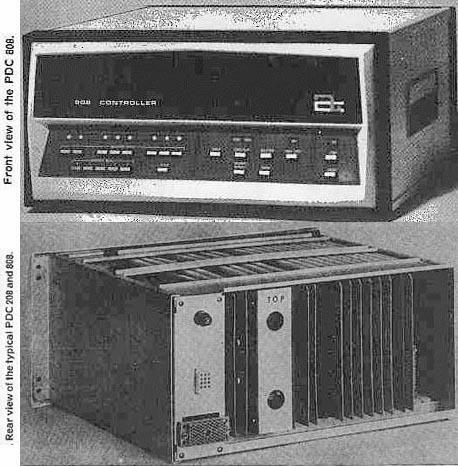 Computer Automation introduces the PDC 808, it as four kbytes of 8 bit core memory. Engineers from Japan's ETI company meet with Intel to inspect work on their calculator IC project. They accept the Intel design for a chip set, and sign an exclusive contract for the chips. (early) Intel receives a request from Japan's ETI company to develop integrated circuits for a line of calculators. Intel's Marcian Hoff designs an integrated circuit chip that could receive instructions, and perform simple functions on data. The design becomes the 4004 microprocessor. Intel announces a 1 KB RAM chip, which has a significantly larger capacity than any previously produced memory chip. Kenneth Thompson and Dennis Ritchie develop the UNIX operating system at Bell Laboratories. Golden United Life Insurance Company begins an internal computer processing center called "Compu-Serv". It later becomes CompuServe Incorporated. Advanced Micro Devices Incorporated is founded. Bill Gates and Paul Allen, calling themselves the "Lakeside Programming Group" sign an agreement with Computer Center Corporation to report bugs in PDP-10 software, in exchange for computer time. Xerox opens the Palo Alto Research Center (PARC). Digital Equipment hires David Ahl as a marketing consultant. Gilbert Hyatt files a patent application entitled "Single Chip Integrated Circuit Computer Architecture", the first basic patent on the microprocessor. Information Sciences contacts Bill Gates and Paul Allen, offering them PDP-10 computer time in exchange for their programming expertise. (spring) Work begins at Intel on the layout of the circuit for what would be the 4004 microprocessor. Federico Faggin directs the work. Intel creates the first 4004 microprocessor. In 1970, Fairchild introduced the first 256-bit static RAM called the 4100. Intel creates the 1103 chip, the first generally available 1024-bit dynamic RAM memory chip.